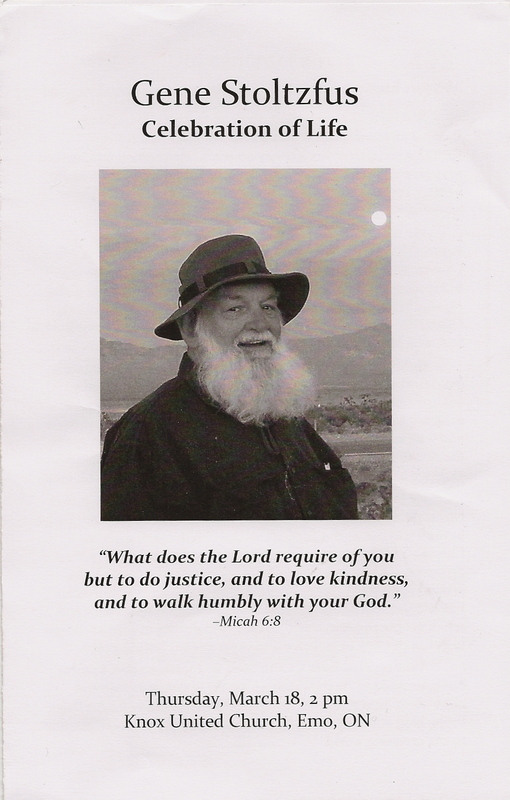 Last Thursday, I attended the celebration of life service for long-time peace activist and founding director of Christian Peacemaking Teams for 16 years, Gene Stoltzfus (1940-2010), which was held in Emo, Ontario. The service was relatively small, as Stoltzfus and his wife Dorothy Friesen now lived in Fort Frances, Ontario, some distance from family roots and former places of work such as Chicago, where they resided for many years. (Memorials will also be held in Goshen, Indiana, and other places.) So it felt intimate and informal, with some of his favourite songs (including multiple singings of “Ubi caritas et amor” – “where charity and love are found, God is there”), Scriptures upon which his work was based, words from his writings, and many personal remembrances. I grew up in a home where great respect was shown for Anabaptists who died for their faith…. An estimated 5000 of them died during their formative era in the 16th century and since. As a child from time to time I would go into my father’s study and take down the biggest book there, an old copy of the Martyr’s Mirror, which had been given to him by his father. I would look at some of the drawings depicting horrible scenes of torture and killing. Then I would read one or two of the stories of how my spiritual ancestors, Anabaptists and others going all the way back to Jesus, lived and died because their faith was out of step with the world around them. I was very impressed with their courage, boldness and authenticity. Then I would put the book back on the shelf and return to other childhood interests. Occasionally I would ask about the stories and would get respectful serious confirmation that yes, these people who lived courageously and died by the thousands were in fact my ancestors. Then I would go about my life on the farm, engage in baseball fantasies and play football. Sometimes I took a long walk in the woods to try to understand what it would be like to live in a world where my convictions could get me killed…. One of the dangerous things that Anabaptists did was that they read the Bible and noticed what it said. This was one source of their courage. Because of the inherent content of the Gospel, it is described as an offense, meaning that it is a challenge to the authority that governments and institutions would like to see go away. The Anabaptists read about losing life in order to save it…. It is good to occasionally check in with the people in our ancestry who thought there were things worth living and dying for…. I didn’t know Gene Stoltzfus personally. My connection was through Dorothy, with whom I’d been in a writers’ group at one time (including a memorable writing weekend at their cabin on the lake), and I also went as companion on the four-hour drive from Winnipeg to Emo, and back, for Sarah Klassen, a friend of the couple. As I participated in the service, ate ice-cream and chocolate (his favourite foods), and listened to the stories in the sharing circle that followed, however, I felt myself touched by his life and spirit. One time I visited Toys R Us dressed like Santa and accompanied by a team of elves. It was a few days after Christmas so the symbolism was still solidly implanted in people’s brains. I entered the store with my staff of elves and immediately requested the manager to remove violent war toys from his shelves. I explained to him how dangerous the toys were and that I had determined that the bad toys must be permanently removed for the safety of children. He replied that what was on his shelves was not my business to which I replied that toys are always my business. We then used the shopping carts to load assorted dangerous toys from throughout the store that my staff of elves had marked for removal. By that time the police had decided to intervene to stop what they called a disturbance but what we designated a recall. TV cameras were also present. I informed the police that my staff and I would leave the store as soon as we had completed our work. The police threatened arrest. We had a quick staff meeting, elves and Santa, and judged that the police would never arrest Santa or his staff. We were right, however the police blocked our progress as we pushed our carts from aisle to aisle and finally into the backroom where we instructed the workers to hold toys for pick up by United Postal Service and prompt shipment to my workshop. So you see Santa can be firm and hard nosed. That is why hard nosed adults should put Santa Claus and his ancient partner Saint Nicholas back into the holiday season! Gene Stoltzfus didn’t die a martyr’s death, but he is now one of those people of the past who “thought there were things worth living and dying for.” And, as he advised we do with such people of the past, it will be good for us to occasionally “check in with” him, through his writings and stories. This entry was posted in Death, Mennonite, Personal, Uncategorized and tagged celebration of life service, Christian Peacemaker Teams, Dorothy Friesen, Gene Stoltzfus, Martyrs Mirror, Peace Probes, Santa Claus by doradueck. Bookmark the permalink. You captured Gene’s spirit in your reflection. I continue to be amazed at how “cleanly” Gene passed to another realm, so joyfully, so purely, the dross cleared, the metal (mettle?) refined that what I am left with is gratitude to have been a participant and a witness to his life. In appreciation for your Presence with us as we celebrated Gene’s life. Yes, thank you, Dora, miikwech for this post.